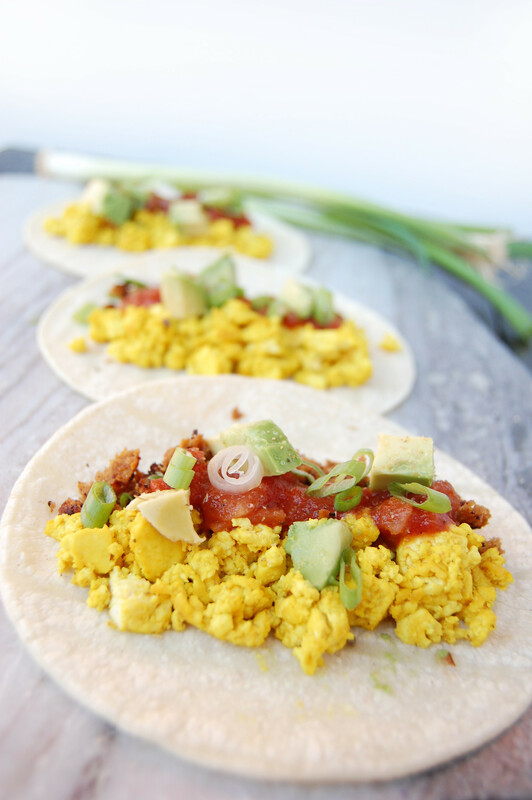 Tofu Scramble Breakfast Tacos - Are You Kitchen Me?! Olé! Feliz Cinco de Mayo! 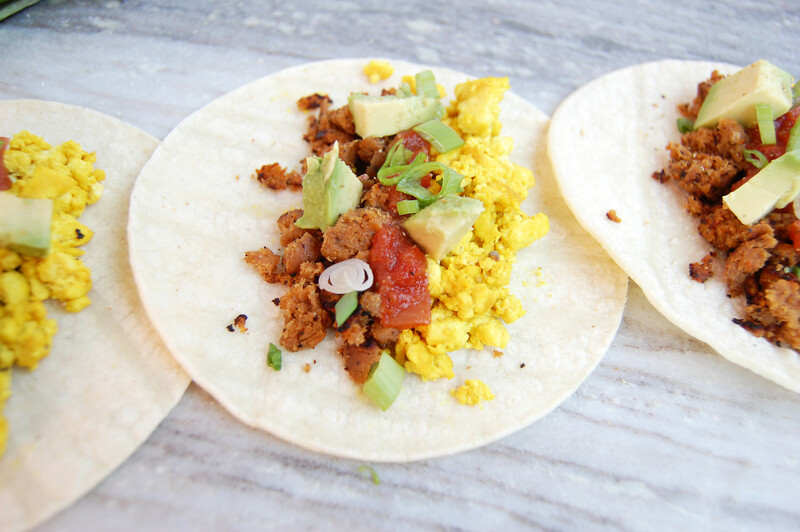 And as if you needed another reason to eat tacos at every meal, I’ve brought you these Tofu Scramble Breakfast Tacos to celebrate Mexican culture and independence. “Eggy burritos” were one of my staple foods growing up. My dad would scramble a ton of eggs, cover them in cheese, and then roll them up with salsa and other delicious fixin’s. I could have lived my whole life on this breakfast staple. Alas, being vegan means leaving some long-held favorites and traditions behind. But does that mean I’m going to miss out on the delicious flavors of my childhood? Tac-no! I won’t lie and tell you that a tofu scramble tastes JUST like scrambled eggs but it’s pretty darn close and definitely delicious. And just like my childhood, this scramble whips up in a flash. I used Field Roast breakfast sausages for these tacos because I wanted a real savory flavor. You could easily leave it out or use your favorite breakfast sausage (real or not). This quick, hearty breakfast is easy to make, easy to eat, and easy to love! Hasta pronto amigos! Adios! Feliz Cinco de Mayo! 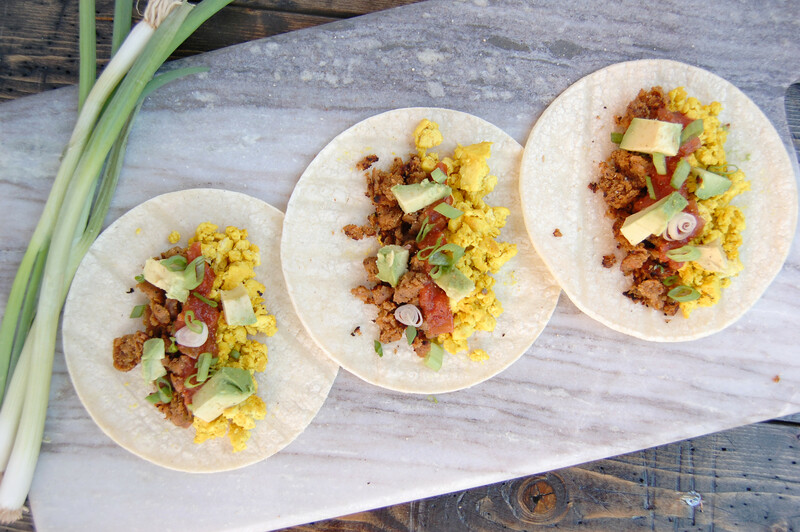 Celebrate with vegan tacos all day long- even for breakfast!! Ole! Begin by pressing all of the liquid out of the tofu by wrapping it in a towel and placing it under a heavy object. Heat a pan over medium-high heat and add a splash of oil or vegan butter. Crumble the tofu into the pan with the spices and cook for 5-7 minutes, until it looks like scrambled eggs. Add a few tablespoons of water, on at a time, if it’s a bit dry. Meanwhile, sauté the sausage in a separate pan until brown and fragrant. Assemble the tacos with all of the fillings and serve! 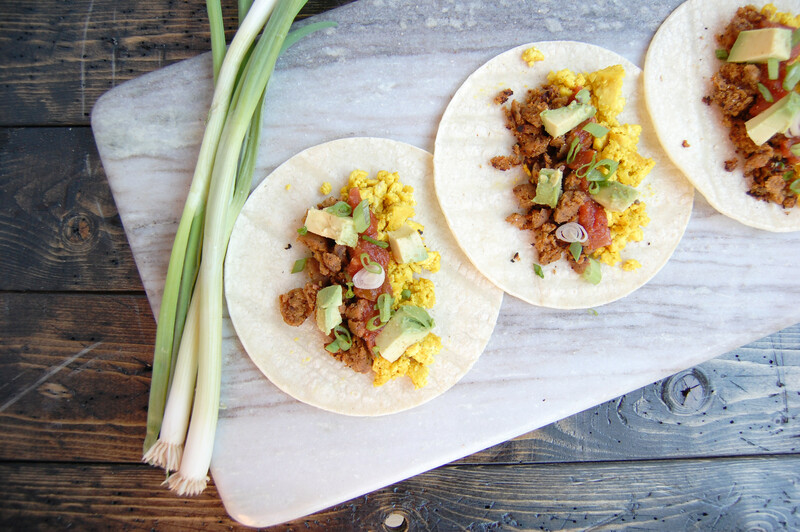 You may have some leftover tofu scramble- it reheats well for tomorrow's pre-made breakfast!